in the Atlanta Metro area showcasing Hydrangeas! We hope you will join us! It will be a great day! American Hydrangea Society including three informative color newsletters. Hydrangeas and we have wonderful plant raffles at our meetings too! Tickets will be available online via PayPal at our website until May 31ST. so don’t worry if you have a last minute addition to your group. For several years I served as the Tour Chairperson of this organization as well as The American Hydrangea Society. I know firsthand about what it takes to create a successful event. So I was not surprised that in recent years the format has changed and only one garden is opened for a day. I like this change. One no longer has to budget their time and rush to see as many gardens as possible in the allotted timeframe. These are SPECTACULAR gardens where one could happily spend the entire day and still not take it all in. This year, the garden of Lyndy Broder was the featured garden. Lyndy is a dear friend and an expert on the genus Clematis. Her knowledge and talents however, go far beyond Clematis. She has collected an amazing variety of unusual and seldom seen trees and shrubs to create a personal arboretum ‘par excellence’ on her property….and almost all are festooned with the most delicious varieties of Clematis one could imagine. The Canadian Geese Meadow leading to the lake above. When a garden of this caliber is open….. everyone comes. This turned into a reunion of great plantsmen and gardeners, a huge amount of talent here, the energy was palpable. This is the first garden tour I attended this season, there are several more on the agenda. I promise to post about them all. Nothing says Welcome quite like a gate. I saw several that intrigued me on the Gardens for Connoisseurs Tour to benefit The Atlanta Botanical Garden. My friend Becky rushing in to get detail photos of this delightful gate. We were tripping over each other in excitement. look at these …. Clever designs and beautiful workmanship. We loved all the details. Gates like these were in several of the gardens, a wonderful piece, both practical and whimsical. Several of Atlanta’s finest private gardens open for this annual event. These are all designer gardens with regular and knowledgeable crews to tend them. They are perfectly groomed. One will never find a yellowing leaf, no space left where a plant was lost, some annual potted plant is placed in its stead, very tastefully. The summer containers were packed with perennial foliage plants and annuals. I was particularly taken with a table centerpiece …..
and of course the peaceful sound of water. All in all a no miss event. With our weather this year, the gardens will be more beautiful that ever. This is a fabulous year for the garden. The French Hydrangeas (Hydrangea macrophylla) are full of buds and it promises to be quite a show. I hope I am not putting a Hex on it. Considering the unpredictable weather we are experiencing, tomorrow could bring an artic blast! Encouraged, I took many more cuttings. I am also propagating two all white varieties ( Madame E. Mouillere & the lacecap White Wave) for my friend Mary who is creating an all white garden. She is well on her way and these white Hydrangeas will be the crowning touch. Isn’t it amazing how much patience a true gardener can exhibit? My garden and I have matured. I no longer stress the small details and rely on good groundcovers through which I will plant some minor bulbs for more early spring interest. Black Mondo Grass (Ophiopogon planiscapus ‘Nigrescens’ ) and Golden Clubmoss (Selaginella ‘Aurea’) were a stunning combination. Then the weeds came. I have to admit that for a few years I painted weed killer on them with an eyeliner brush! I am very fortunate to have on my property many native wildflowers, while they are ephemeral and will disappear when the summer heat comes on, the low growing Vinca does a great job picking up the slack. Above, Leaves of three, Trillium & Poison Ivy; underneath, a carpet of Vinca. This mottled ginger (Asarum splendens) is one of several types I planted, it is the only one that has survived & thrived. It is located across from the Mourning Bench. This was the only area where I originally planted perennials. What comes up now are the tough survivors or the plants that re-seed. Below the subtle colours of Japanese Painted fern ( Athyrium nipponicum) & Mottled Ginger blend beautifully. Contrasting texture is the key here. Elsewhere in the garden, the Viburnums have been sensational and there are still a few blooming. This year Kern’s Pink has outdone itself. So heavy with blossoms it has covered an unknown rose. The only misstep this year was the loss of two mature Clematis. Victims of the mow and blow guy….. I guess one cannot have everything…..all at once. Often, in the garden, I only see all that needs to be done; the plants that need feeding, the pruning that is overdue, the weeds that must be removed before they set seed…..
Clematis ‘Asoa’ twining through the Viburnum…. So what if the vegetable garden is overgrown with chick weed. I have seriously been considering getting some chickens again. They were so delightful. I loved their antics and they kept the weeds down. Hmm… Oh yes, I forgot the predators and the heartbreak when one is ‘lost’. 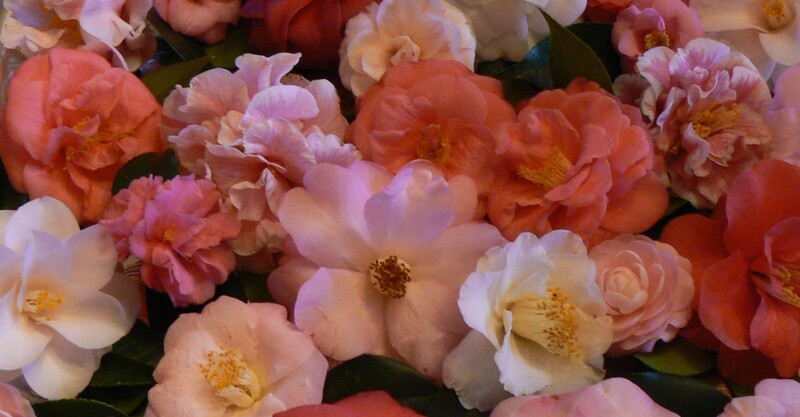 When I was out walking in the garden today I was admiring the camellias. They are the evergreen structure that forms the bones of the garden and they bloom to boot! the meadow was not cut last summer so there are plenty of weeds, and several trees and limbs are down. Victims of the heavy saturating rains and strong winds of late. One of the first times I’ve seen the incredible flowers of the ‘evermottled’ ginger…….. blooming at ground level. I have not often seen them as I’m hesitant to crawl around the garden on all fours when it is cold and damp. This one just jumped out at me.